The Commune and their “slave working locations” were also my hangman, whom I had to overcome to return home. When meeting the Commune, they “instantly” decided that I had a “normal working capacity” and soon they ordered me on my first slave job: Physically hard work as a gardener, which was killing me. I did a superfluous job search course with selfish people reporting their misunderstandings and not the TRUE picture of me to the Commune, which was darkness almost costing my life! WRONG feedback on me and my “negative” writings convinced the Commune that I was “anti-social”, they tried to remove my FREEDOM of speech and removed my cash help leaving me to die! In the minds of the Commune I was now “crazy” and “suddenly” I had lost my “normal working capacity” (!) and “of course” they could not approve for me to do my own “crazy work”! I was now without an income starving and abandoned by everyone and after a few months I had my cash help returned, however I did not receive protection of my freedom of speech! Before my help was returned, I was alone and starving and not even NGO’s, churches etc. could help me – this was my dead sentence at the same time as it was my FREEDOM to save the world! The Commune HELPED returning my cash help “immediately” and after three new months of work in the park, they finally understood that I really worked HARD and had GOOD relations with all :-). I received the extreme disgust and nervousness of the Commune towards me as direct sufferings too. In December 2010 I was again declared fully capable to work, which was changed in March 2011 without my knowledge (!) and first in June 2011 after ILLEGAL work for Falck, I was rehabilitated! For two years I did “slave work” for the Commune “only wanting to help me” with the conclusion: You misused me terribly, did NOT learn me anything, but I taught all of you how to truly work! I gave everything I had to help Falck, and they gave me all of their worst negative feelings, which brought me much suffering and fear, which was needed to create energy to change creation self! The Commune considered giving me disability pension in June 2011 (!) even though they knew that I worked better than everyone and had good relations with all – how “crazy” can you get? Helsingør Commune threatened me with a new death sentence and feared that I was a potential mass murderer as Breivik, and even whistled on me behind my back to the National Police! December 2011: To Helsingør Commune: STOP HARASSING ME and accept my FREEDOM to speak and work! In December 2011, the Commune brought me the verdict of the official system: “We don’t believe in you, we don’t want to listen to you, we don’t like you, we will take charge ourselves and decide what is right or wrong”, and in February 2012 they maintained that I am “unfit” to work because I am negative (!) and because “millions of people” will believe the same for claiming that I am Jesus. They believed I was a ”narcissist, who loves himself and keeps on talking” (!!!) – nothing could be further away from the truth! They were sick because of the “the Jante law”. The final verdict of Helsingør Commune, May 2012: “Stig is schizophrenic” and cannot work (! ), which even children from kindergarten can tell is WRONG! In June 2012 a psychiatrist declared that I appear perfectly normal but he misunderstood my spiritual communication as delusions, i.e. “paranoid schizophrenia”, because compulsory thoughts made it “impossible” for him to read and understand me. The reactions of people to the declaration brought me the worst suffering of all during my journey. July 2013: How two municipalities and the Psychiatric System of Denmark with brain dead systems/people developed into my executioners. July 2013: The Journal of Helsingør Commune on me and my email telling them about their “better-knowing ignorance” and neglectful human behavior. Updates 2012-2017: The Commune refused to declare me completely fit for work and wanted stronger and stronger to transfer me to Permanent Disability Pension, in this regard, Lisbeth from Helsingør Commune acted as victim, but is the executioner forcing the final dead sentence on me. I confronted an entire ROTTEN system as Mogens Glistrup also did. It killed Glistrup and was “this close” to killing me, because the Devil does not like to be challenged, i.e. to be terminated! Jobcentres were the killer machine trying to break me without knowing that they brought me darkness to create our New World. May 2014: My email to the official system (municipalities, psychiatric hospitals etc. ): You were the System of Hell MISUNDERSTANDING and TERRORISING me when you believed that I was crazy, dangerous and wanted to kidnap/lock me up on Psychiatric Hospital. From December 2014 and forwards: Helsingør Municipality, the Appeal Board and attorney to the government acted directly illegal and unethical rejecting to give me the ”special home aid” they cheated me for forcing me to ”live on a stone”. First in October 2015, I won the case when the Appeal Board decided in my favour, and I first settled the case in March 2016 after having received interests, but not reimbursement for “hundreds of hours of work”. Mails from May to August 2015 to Helsingør Commune and the Psychiatric Centre To ”the system of Hell”: CANCEL your WRONG verdict/diagnosis of me! I understood the Pastors of Lyngby Church, but they could not READ and UNDERSTAND me – not even the Church was “able” to recognise/support me because of their strong voice and selfishness! Below follows the full version of this page. The Commune treated me as a SLAVE and LUNATIC, and not even the church recognised me! A large part of my scripts are about the “Master and Slave system” of the Danish “labour market system” including the Commune of Lyngby-Taarbæk, who were supposed to HELP me receive a new job or even better just to help me financially because my own work of writing did not give me an income when NOBODY “reading” my website found it necessary to support me helping me to continue and end my writings – to save the world (!) – but the Commune was not “able” to do any of this simply because of the terrible system of “slave work” and bureaucracy and human misunderstandings and uncontrollable negative feelings towards me not understanding my purpose also to write the truth directly about them and the “slave working locations”, which they decided to send me to supposedly “designed” to help me “prepare” to return to the job market, which I had absolutely no need to become part of (!) and was also nothing else than a total waste of time! The Commune and these work locations were also my hangmen, whom I had to overcome to return home! I have written much about this continuous story in my scripts from 2009-2011, but to cut a long story short, when I first registered with the Commune in 2009 – before my writings were published – they could tell “instantly” that I had my full working capacity and was completely normal and I was herewith enrolled in the “match group 1” for people having a “normal working capacity” and soon ordered to start my WRONG “work practise” as a gardener for 10 weeks in Brede Park – not at all taking my competences into consideration (!) – which they had to do according to the “crazy law” as a requirement to “lift my qualifications” (! ), but in practise the Commune was careless about this requirement, everyone was given the same poor standard “treatment” despite of their background, and this is how I started what became very hard physical work as a gardener – without salary, still receiving public welfare making me considerable underpaid compared to the otherwise accepted minimum pay of this community – simply because I was seen as “strong” to do the hardest job of all people “serving their sentence” there – despite of my sufferings killing me – and when I kept on working without being lazy as everyone else at the place (!) I was given more of the same hardest work, which was extra wood to the fire killing me. After this “work practise”, I was ORDERED by my dictators of the Commune – overtaking my life when they removed my personal responsibility (!) – to continue now on a three months course as I remember it to learn how to write job applications and CV’s and the only “problem” was that I did not need this help because I know how to do this (! ), so after one week of “learning”, where I read their text book carefully, I learned that I had learned absolutely nothing (!) – I had ALL of the knowledge of this course in forehand – but when I tried to teach the teachers of what they could do to improve, one teacher reacted negatively, which was also because I decided not to follow her WRONG “guidelines” of how to improve my CV (!) – she “could” not “take” my “bragging” CV without understanding that I was not bragging, but telling the truth about my competences and she was “worried” about how employers would see it (!) and consequently I could not accept her WRONG feedback to me (!) – and furthermore, when I told an extremely lazy, but nice man attending the course very clearly what to do to help him get started – when a male teacher could not get him to understand – he also “had” enough of me without understanding that I did my best (! ), and these misunderstandings were reported wrongly to the Commune as “Stig is negative, does not listen and cannot control his temper” (!!!) without telling the Commune the true feedback, which was that all people was very happy with me (! ), which almost cost my life because darkness was defeating me dissolving me from the inside (!) also giving me the absolutely worst throw-up feelings because of just how wrongly people were behaving against me (!) where I was truly hanging in a very thin lifeline working on my extreme edge of discomfort trying to correct these errors of selfish people, which the male teacher then decided to correct after I had decided to take a very “unpleasant” but “positive” meeting with him telling him the truth about me, which was “saving” me also through this. When I after a few weeks at the course, the 1st February 2010 decided to publish my writings from 2009-2010 including my daily writings from the course telling the truth of the course and teachers/attendants directly – I sent my publishing email to several of the attendants too – and they discovered what I had written about them and when they as (almost) everyone else focused on themselves without understanding the big picture and decided to read and understand “negatively” instead of “objectively/positively”, the teachers and attendants “suddenly” did not like me to stick around anymore (!) and I was expelled from the course (! ), which was both very humiliating and WRONG to do and the reason was simply that I had told the TRUTH about lazy people and how poorly courses like this work and of course their misunderstandings and suddenly I was met with negativity from several people and the only one, who did not change, was me! And this is what I have seen many times, which is that people are very or even incredible (!) positive to me when they do not know who I truly am, and when they understand who I am – or what they believe is a sickness of mine – and for some also my writings on them, they suddenly become as negative as they before were positive and withdraw without saying a word, and we know a “mental disease” as they believe I have is a taboo and people do nothing in practise to understand or to help if this is what I needed, which is truly a disgrace. And when I have explained A2B standing behind this job course, the Commune, family/friends etc. about the right things to do, they have often thought that I have been “incredible difficult” when “telling them” without understanding that they were looking in the mirror because it was themselves creating the difficulties when they simply “could” not listen and understand me and if this has also been a suffering of mine (? ), and yes you bet – it has been disgusting to look at and a disgrace to ignorant people of poor habits! WRONG feedback and my “negative” writings convinced the Commune that I was “anti-social”, they tried to remove my FREEDOM of speech and removed my cash help leaving me to die! Later I was ordered to a new meeting with the Commune and also Brede Park, where they wanted to send me back to – illegal according to the law by the way (!) – and now the Commune knew that I had been writing also about my experiences with them and the park and since they did not truly read and understand my positive lessons but also focused on themselves negatively misunderstanding me, they only saw their own limited and selfish “interests” being threatened and because of this, they tried to remove my freedom of speech and force me to work at the park – now they furthermore talked about letting me work in a “protected area” away from people because of my apparent anti-social behaviour (!) not understanding that I am and was well liked by all people and that it was people who were anti-social towards me when they could not understand my positive writings because of their own selfishness (!) and this misunderstanding was also crying to heaven because of its apparent unreasonableness (!) – and they asked me directly not to write about my experiences at the park without their approval (! ), and when I told them that I could not accept them violating the constitution removing my basic human right of freedom of speech (! ), they decided WRONGLY that I was no longer “available to the job market”, which I was as I told them (! ), and to remove my cash help as the consequence knowing that this would make me starve and essentially was a dead sentence (!!!) – this was in May 2010 – and all of this because I was now apparently “extremely negative”, writing “disgusting things” about them (the truth!) and obstructing without understanding that all of this was only made up in their own twisted minds, and that I was fully available to work as I told them on the condition that they OF COURSE would keep the Danish constitution (!) but this was too much to ask you to do? There was NOTHING I could do, I was now truly a BAD guy in their minds and I had absolutely NO right (!) to “exhibit” their laziness and wrong doings both at the park and also at the Commune. They did not like me telling the world the truth about them, and I did wrong in their minds when I did not keep their WRONG work and behaviour a “secret”! The only ones who acted wrongly was not me, but them! Furthermore they had decided that I no longer had a “normal working capacity” because of course it was “obvious” that when I wrote that I was the Son of God I had to have “other problems than unemployment” (!) and the only problem was that I had NO problems to work or relate to people (!) – I did not speak but only wrote about who I am – and I told them over and over again that I was not unemployed, “my problem is NOT lack of work, but lack of income” but of course it was “totally impossible” for the Commune to approve my TRUE work as a writer when I apparently was “crazy” – they did not have to read either to make this “truth” up (!) – and writing so “negatively” and the “funny” part here is that if they truly had read and understood, they would easily have been “able” to approve my work as a “work project” to be supported financially instead of giving me superfluous “slave work” (! ), so my work was “not important” (? ), but maybe the world will one day find it “important”, which you will too when you will do what I basically encouraged you to do many times, which simply is to READ and UNDERSTAND, but this was too much to ask you (?) – but of course if they had done what was right, I would not have been able to save the world, you see? This is how I the next “couple of months” was starving without an income and almost no food and when I complained to the Employment Board, I had to wait a few months on their verdict (!) – without an income waiting on their bureaucracy, which could have killed me, which was not easy to accept – and when I finally received their verdict, on one hand it decided for my cash help to be returned, also including the months, where it was wrongly taken away from me, but it was because of “technicalities” and they did not relate to my complaint about the Commune removing my freedom of speech herewith violating the constitution of Denmark (!) and we know a politically “motivated” verdict (!) and the reason was simply that the board did not like my writings too (!) so instead of protecting my basic human right to express myself freely, they only wrote that I was responsible to the law when I decided to write (!) – did you forget that my basic human rights and constitution comes before everything else? This was also to show you that Denmark is NOT a free country as it otherwise praises itself to be; Denmark was a country imprisoning its citizens with a warped view of human nature because of the work of the Devil focusing on control, money and selfishness – without truly knowing how to lead and develop people! Thus, I again received my cash help, but for a few months in the middle of 2010 I was both starving and TOTALLY ALONE with no contact to and help from family/friends etc., who had decided to abandon me in this period – the world had dismissed me, I was technically not living, which was exactly what was needed to reconnect with the Source as I did this summer of 2010 (!) – and when I wrote directly on my website for my family and friends to see that I was critically in need to receive help not to starve, I received no answers (! ), and therefore I contacted a number of NGO’s, social organisations, churches and also local supermarkets and restaurants asking to receive help but despite of writing that their help was critically needed, I received no answer from most – but one example showed me that some people simply did not believe that I needed help (!) and others were probably “too busy” to throw out their old food instead of giving it to me as I had asked for (! ), which was to show you other “misunderstandings”, laziness and “lack of compassion” in practise (!) – and I only received VERY little help, which I decided to share with my LTO friends in Africa, because only through their survival and faith in me, I would be able to go through this period. The world had judged me, they decided to abandon me without helping me. This was my dead sentence at the same time as it was my FREEDOM to save the world! My contact to the Commune was re-established and of course they only wanted to help me (!) and of course they knew that it was not nice to starve – because of their decision (!) – and this was really the starting point to slowly changing the perception of the Commune in relation to me (they did not se how I worked when they were not with me every day!) and there was suddenly no problem to re-establish the payments of my cash help “instantly” in order to bring me food, which I needed “here and now” herewith cutting through all bureaucracy, and this is also to say that I have had FINE relations with all people in practise – we liked each other underneath the misunderstandings (!) – and it was as mentioned only negative misunderstandings of my writings, which made people oppose me and “difficult to understand his negative writings when I was a positive man to be together with”! After this, the Commune decided to send me back to work for three months at the park again asking me not to write about my experiences (!) and I told them that I had finished my teachings, this is what I was spiritually told myself, thus not in need to write, but eventually I got started again because I discovered that there was indeed more teachings to write. Consequently, I spent another three months at the park now working even harder than the first time also removing EXTREME darkness coming to me – this was some of the worst of everything – which continued to constantly bringing me and the world down if I was not able to absorb it, and I continued to have FINE relations with everyone without the need to be “isolated” (! ), and of course the Commune “had” to check up on me paying a personal visit at the end of this working period at the park to see how I was doing – humiliating to say the least (!) – and they “discovered” as I had told them all along that I was working HARD and had GOOD relations with all (! ), and isn’t it funny that the Commune did not understand the truth for such a long period, which was obvious to everyone else I was working together with on a daily basis? I was now slowly on my way back to life! Since being expelled by the job search course in February 2010 and throughout both 2010 and 2011 I had to visit the Commune for new meetings with an interval of maybe 3-4 months and whenever I received an order to meet them with a notice of up to one week, I received extreme feelings of disgust all of these days, which was both because I knew that it was “impossible” for them to TRULY listen to and understand me, that they would now order me again against my wishes and also because their discomfort and nervousness to meet me – “he is extremely difficult” (!) – was brought directly to me as sufferings and it was TRULY painful to receive all of these negative feelings, which you know was brought to me as part of all the negative voices, feelings and visions I received? In December 2010 I was again declared fully capable to work but changed in March 2011 without my knowledge (!) and first in June 2011 after ILLEGAL work for Falck, I was rehabilitated! At one of these meetings in December 2010 I managed to “convince” the Commune to do their best to listen and understand (!) – which they tried to show me that they did everything they could because of my “challenge” – that I had a completely normal working capacity and good relations with all people as I have always had and as they could see at the park (! ), which made them follow my request to move me back to the “match group 1” of so called “normal people” also because I told them just how humiliating it was to be downgraded to “not normal” when everyone could see that this was WRONG. In March 2011 I was asked to start new “work practise” for the rescuing company Falck for three months, which I accepted without knowing the law and without being informed that the Commune had now moved me back to “match group 2 – I had not been informed of this change (!!!) – and first at a later meeting with the Commune in June 2011, I received this information (!) – the reason for moving me back to group 2 was that the manager could not accept the “special arrangement” we made in December 2010 for me to be in group 1 but to be serviced by group 2, which I only accepted because of the recommendation of the Commune self (! ), which was a symbol saying that the faith of the world in me was not strong enough to be able to create a New World – and when I insisted to be moved back to group 1 in June 2011, this was AGAIN accepted but now under condition that I could prove that I was able to work full time for Falck for an additional one month (!) and not only the 9-16 hours per week as I had done for the first three months, and again this was completely irrational and humiliating too because they knew that I was working 50-60 hours per week doing my “own work”, which however was not accepted when they did not “care” to see just how much I was writing on my website, which should have been “confirmation” enough for them (! ), so there was ABSOLUTELY nothing I could do to make the Commune withdraw their both WRONG and also ILLEGAL decision (!) to provide the “proof”, they needed for their “journal” on me (!) that I was truly able to work full time herewith showing the total breakdown of this system because by now they did know for a fact that I worked better than everyone else, also because they received very positive feedback from Falck on me – and after I had completed this work, which was also truly impossible to do because the truth was that my sufferings made me a “living dead” and unfit to work (! ), which I however decided to ignore, Falck wrote to the Commune confirming that I had been “stabile” and worked “completely without problems” for them and also that they had been happy to have me. For two years I did “slave work” for the Commune “only wanting to help me”: You misused me terribly, did NOT learn me anything, but I taught all of you how to truly work! The story of my “work practice” with Falck is covered both in my scripts and in my Falck memo, but in short, also at Falck – as with the Commune, Brede Park and also the job search course and really every single employer I have worked for in my professional career since 1984 (!) – I met the same wrong attitude of “managers” dictating me without understanding my true competences, and I went through much suffering also at Falck to do their worst work, which they could not “motivate” themselves to do (!) and really because they decided to use me as a slave for their own benefit instead of truly using my competences, and this was the end of my so called “work practises” at the Commune. You did NOT teach me anything, but I taught all of you how to truly work, which was confirmed by a manager from Falck telling me “we know that you have not learned anything from us, but we have learned much from you”! I gave everything I had to help Falck, and received their worst negative feelings, which brought me much suffering and fear, which was needed to create energy to change creation self! At my last day in August 2011 working for Falck in Lyngby, I sent them my memo telling directly how to “lift” them up to do the best quality herewith also “revealing” so called “business secrets” and “embarrassing moments” of primarily managers, and I decided deliberately to publish the memo on the Internet to support my Basic Working Rules as a requirement to enter our New World, and on basis of the interest of both Falck and the Commune to “read” my memo, I could tell that they again focused on their own narrow minded “interests” instead of the big picture and again I became afraid of what I would be met with; would they decide to pursue me trying to remove my now public writings or would they at the end decide to let me be also because they knew and could read how much I like them (?) and I felt all of this resistance coming to me as very strong darkness – I gave everything to help them, and they gave me all of their worst and negative feelings instead of understanding the big picture and thanking me to help them (!) – which was at a period where I again had lost contact to my closest family bringing me even more darkness – not because of me but because of them – and all of this energy was used to turn around the spiritual world, change the original creation self and to revive my old previous self, which you may understand was “impossible” to do, but it had to be done. When this is written in the beginning of October 2011, I still don’t know if the Commune would like to give me permanent disability pension as they WRONGLY “threatened” me with at the meeting in June (!) because their “strong voice” told them that I was only interested in doing my own work and therefore not “available for the job market” – they knew that I followed all “crazy rules” to the point to be “available for the job market” (!) – and do I have to tell you that I had completely normal relations and communication also with these two ladies at the Commune (?) – and I could only tell them that maybe they would THINK about helping me to get work – when they could not accept that I did my own work (!) – which should be easy for them to do with the INCREDIBLE positive feedback they now received on both my work and relations with people, and isn’t it incredible just how CRAZY people around me were when they were driven by their own misunderstandings making them take WRONG decisions (?) – they wanted to give the best employee/manager disability pension even though they knew that I was indeed working better than others (!!!) – and when I told them that they took apparent WRONG decisions, I was told that “we are certainly not” (! ), and what else could you expect from ignorant and lazy people? After I stopped working for Falck the 5th August 2011, the Commune did not “invite” me for a new meeting before I moved to Helsingør the 13th October 2011, so I never received the end of what they would have decided to do, but maybe you will tell the world and also “like” to put forward your “journal” on me to document your “fine work”? When I moved from Lyngby-Taarbæk to Helsingør Commune in October 2011, I thought this would become the end of the sufferings given to me by the official system of Denmark, but this is not how my road was designed. I was forced as a mandatory rule of Helsingør Commune to attend a four week “job search course” from October to November 2011 with the company called IKU (“Institute for Career Development”), which I had absolutely no need to attend (! ), and the first three weeks I received nothing less than an enthusiastic reception by a young female job consultant working there, who saw my “true self”, when I was outgoing, strong, smiling, positive and with a view to change the world, which pleased her very much to hear – she also “read” some of my website without becoming offended (!) – but her smiles and positivity suddenly changed to the opposite after I started speaking to two of her colleagues with the first one trying to “help” me by “teaching” me how to write a job application (this lady thought I did not listen to her, which she later reported officially behind my back all the way to the Commune without understanding that I truly had listened to and used some of her advice (! ), and the truth is that she did not listen to and understand me trying to give her the TRUE teaching of this meeting about how to truly write a job application!) and the second “tried” to help me receive a “work practise” position at the Danish Parliament of Christiansborg, which he however quickly gave up on, when he – and his colleagues – saw my website and job applications written in a very direct language, which they “could not” understand – because they did not take the time truly to read in order to understand that the content was the truth and only meant with my heart to help people – and as a consequence, they quickly decided that I had to be “crazy” (they did not have to read or speak to me in order to understand this “truth” inside of their twisted minds), and this is what also made the young female consultant turn around on a plate and now doing her absolutely best to avoid me apparently becoming afraid of the same man, which she was nothing less than thrilled about before she was “taught” wrongly by her misunderstanding colleagues, and it all ended the last day, when the team leader of IKU told me that they could do “nothing” to “help” me find a job because of how I formulated my applications (!) – he did not mention my website (!) – and he gave me an “invitation” to meet Helsingør Commune a few days later, which he had informed about me claiming that he had told them that they did not believe they could help me get a job – strange when all employers are VERY happy for my work, which they never understood at IKU because of their negative approach – but on the other hand that I had been positive when talking about “work practise”. I could do nothing about the negative focus of IKU other than saying that I was sorry that they decided to take a negative approach, but I had no idea of what they really had told the Commune about me not written down anywhere – did you see a potential “monster” in me bringing on this “fear” to the Commune (?) – but when I met Helsingør Commune in November as you can read here, I was mentally prepared for what I thought would be the absolutely worst they could do to me, which was to declare me disabled – which would be quite a paradox because I work as “the best” and have good relations with all – and I was therefore very surprised when the Commune first threatened to remove my cash help for not being “presentable” because of what they saw as “negative writings” in my applications, which they believed was a deliberate attempt of mine not to receive a job (!) without understanding that I only write the truth directly to help people and make them understand and that all employers would decide to employ me straight away if they simply read and understand the content and my competences, but instead of understanding that “everyone else” than me is the reason why it is “impossible” for me to get a job, the Commune wrongly decided that I am the problem (!) as mentioned threatening to remove my cash help if I did not stop being so negative! The Commune also told me that “we want to make sure you are not another Breivik” – the Norwegian mass murderer of 2011 – which they believed was a risk because I write in “my sufferings” on my website, that I received the voice of darkness giving me a “kill, kill, kill” command, and what they “could not” understand when they did not TRULY read carefully and objectively – but negatively and wrongly (!) – was that this was the darkness trying to force me to ignite the Doomsday Weapon to end the world, which is not a physical weapon on Earth, but what causes a new Big Bang (! ), and I had to speak to this nice lady for 1½ hours trying to persuade her negative demons that she was wrong to fear and have suspicion to me – “I am all about good, and my website is a message of love to man” – and to encourage her to truly read my website in order for her to be “able” to understand. What she did not have the “nerve” to tell me was that she had obviously warned the Danish National Police about me as a new potential mass murderer because the same day as my meeting with her, I received visits to my website by the National Police searching for “Breivik”, “Norway”, “Oslo” etc. on my website, and can you imagine how it feels like to receive the threat of a new death sentence – also thinking of my LTO friends in Kenya – from an ignorant but still better-knowing lady wrongly thinking that I am crazy without having read my website carefully and without understanding that the roles were switched with her being “crazy” when she could not control her negative feelings in relation to me and thinking the absolutely worst of me already before meeting me – also without receiving the feedback of the young female IKU consultant on me from my first three weeks there (!) – and then to learn that she has whistled on me behind my back to the National Police without having the “nerve” to give me this information. Apparently the National Police checked me a few days as a potential “national security risk”, but nothing more happened. They soon lost interest when “reading” some of my material. You can read the full story of this in my script of the 22nd November 2011, and yes it made me very SAD indeed – I always get sad when people try to teach me about their own misunderstandings without doing a proper job taking the right conclusions and decisions – and furthermore it gave me so much darkness with negative voices, my “old nightmare” and lack of sleep and energy for days that it was “more than I could bear”, but still I decided to be stronger and continue working all the way to the end finishing ALL of my work! After I had sent an email the 5th December 2011 to the entire management and political leadership of the Commune including the local newspaper – see below – I had my last meeting with the Commune the 13th December as you can read here, and before the meeting I was told spiritually that the City Council held a closed meeting about me deciding that it would “not be nice” to have a “story” in the local newspaper about how the Commune harassed me giving me a potential death sentence by removing my cash help, so instead they decided to interfere with the case work of the Commune and to agree with their “friends” at our local newspaper not to bring my story but to “help” me with my “craziness”, which I understood was to help showing you the ROTTEN CULTURE of Denmark and the world of today, which really did not make me feel good to be treated as DIRT. In this email to the political leaders of Helsingør, the management of the Commune, the Jobcentre and my local newspaper, I ask the Commune to STOP HARASSING ME: To accept my FREEDOM to speak/work, remove their death sentence on me (! ), stop being dictators humiliating me and stop believing I am a potential mass murderer as Breivik!!! Finally, I had the new meeting with Commune, who “decided” to move me to match group 3 of 3 declaring me completely incapable to work (!!!) and to first get a medical check-up by my doctor, and if this is fine, also a meeting with a psychologist! 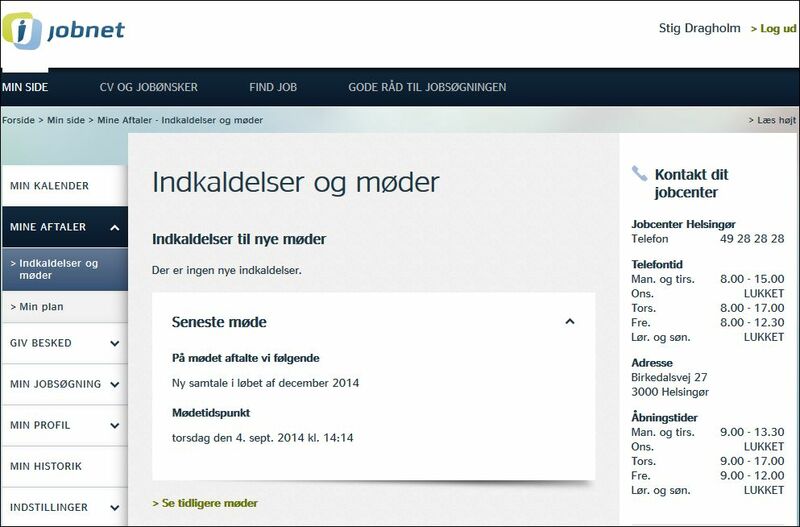 This is the verdict of the official system of Denmark saying: “You are crazy and not capable to work” (!) even though I have shown the system that I work better than anyone else and have good relations with all! This is what POOR WORK, IGNORANCE AND KNOW-ALL ATTITUDE CAN DO – the system was not “able” to understand the SIMPLE LOGIC I wrote even though they liked me as a person and when I spoke of my writings, it was “easy” to understand the logic, but because they don’t read the details of my applications/enclosures/scripts, I am not “humble” but “uncompromising” in their eyes, thus crazy – I am NOT to come and tell them to change their ways, and this DEAFNESS/STUBBORNNESS and wrong doings is what threatened to eliminate the old world and kill my old self . A nice lady, but she made me suffer MUCH helping to trigger the gun finishing my old self off. In February 2012 I had a new meeting with the Commune as you can read here, and after the doctor, which the Commune forced me to visit to make a “sanity check” on me (! ), had declared that I am fully capable to work, the Commune maintained their decision that I am unfit (!) because of my “negative applications” not understanding that I simply write the truth to HELP people, and also because “millions of people” would say the same as them because I say I am Jesus on my website (! ), and I was told that I am a ”narcissist, who loves himself and keeps on talking” (!!!) – yes my friends THIS IS WHAT SHE TRULY SAID – and it did NOT help me telling her that nothing could be further away from the truth because normally when I meet people in “normal situations”, I speak/listen/reflect with a good balance as “everyone” can confirm, but I was told “you cannot communicate”! This was the verdict of the Commune at this time making me VERY sad to listen to, and it was ONLY based upon their own “inability” to understand, which has made me try my best to make them understand, which again made them “compose” this subjective diagnosis, which fitted them, but was NOT the truth and did NOT help me. This was a “highly educated” lady, who was STONE DEAF and objectively a “stupid fool” for not being able to listen/read/understand. The sickness of her and the world is called “the Jante law” – “don’t believe you are anyone special even if you are, we cannot take that”. The final verdict of Helsingør Commune, May-June 2012: “Stig is schizophrenic” and cannot work (! ), which even children from kindergarten can tell is WRONG! On May 8, 2012, I met with Lisbeth from the Commune again as you can read from my script here, and by now she had received the “verdict” of Jytte, the doctor, on me after she finalised this with a three months delay the second last day before she stopped working as doctor! Despite of doing my best telling the doctor about what spiritual communication is, this doctor decided – based upon her WRONG text books and WRONG journals on me (!) – that I suffer from schizophrenia (!!! ), which no one can see – even including children from kindergarten (!) – when they meet me or work with me, but this is what this CRAZY system believes I am, amazing right (?) with the truth being that they are RAVING MAD not being able to “understand” what I have shown them so many times before through my completely “normal” behaviour and work, or let us say both behaviour and work well “above average”, but still this is NOT enough! Lisbeth thought that what I say and write in general makes sense, but still she “cannot” accept me as the truth, and she also knows that schizophrenic people are normally not positive as I am, but still she does not understand ….! The health declaration of the “doctor” concludes that I am “chronically mental sick” without self-insight (!) based upon a WRONG statement from an ignorant doctor in 2008 – amazing, right? The doctor says that I don’t put forward “psychotic statements” and am “well speaking and well-formed with a good memory”, or in other words “Stig is crazy, but you just cannot see it on him”, this is what it says (!!! ), and it also says that I have unrealistic thoughts of my working capacity, cannot use my education to work and not fall into an office milieu (!!!) – talk about a “petty official” who also went DIRECTLY against what she told me verbally in January that I am fully capable to work having NO DOUBT in her voice (!) – with the truth being that the doctor suffers from ignorance, an unrealistic perception of reality and compulsory thoughts, and she ended by recommending a psychiatrist to “evaluate” if my “schizophrenia without hallucinations/delusions” (!) can be improved by forcing me to take medication (!) – RAVING MAD is what she and the system is (!!! ), but the slow working and thinking Commune decided to follow this crazy recommendation, so this is now next thing in line, unless I open up the eyes of my new self before coming to this point. And if I was sad because of this “completely out of this world” decision (? ), and yes YOU BET! In June 2012 the Commune forced me to take a meeting with a psychiatrist with the risk of the psychiatrist to decide to bring me “killing medicine”, which I would have rejected probably costing my cash help if he did, or to commit me to hospital against my will, and he did neither, but not because he thought that I was well, but because he saw me as “raving mad”, where medicine would not have an effect and because my conditions it not acute nor dangerous, he also let me go free without hospitalising me! But he concluded WRONGLY that I am not functioning well socially with people even though “the formal contact is fine”, I have “fine eye contact”, “he is whole”, he shows no signs of “sadness, being tense, irritable” or angry” so all in all he really wrote that “Stig is perfectly normal” except from a WRONG belief that I miss the ability to feel (!) – he did not understand the positivity of what he also thought was my negative writings and that I have good relations with all people – and he decided NOT to believe in my spiritual experiences (he had no faith, you know), and he therefore concluded that these are “extensive and systemised delusions of megalomania” and “according to my view, there is no doubt of the diagnosis: Paranoid schizophrenia”! This was the conclusion of yet another man from the psychiatric system of Denmark working poorly, being reserved/cold, and missing the ability to communicate/understand because of his own lack of faith and strong voice only believing in himself and his wrong culture/experience, and he was the consultant psychiatrist of a large psychiatric centre! This decision made me suffer the worst of my entire journey because when I published his declaration here, it became the document most read of all of my documents on Scribd in one day bringing MUCH negative power of darkness to me from people resisting me believing in the psychiatrist herewith giving me the worst lack of sleep and the most negative and sexual torments of the Devil. And foremost, it made me SAD that the psychiatrist “could not” listen/read and understand what is easy to understand, i.e. the truth about me, and to see how also he was directed by compulsory and negative thoughts. He also believed that I miss the capacity to work in any business, which will now make it possible for the Commune to start a new case to give me permanent disability pension (! ); the official system disabled me even though I had shown them that I have better relations with people and work better than others. Updates 2012-2016: The Commune refused to declare me completely fit for work and wanted to transfer me to Permanent Disability Pension, but “could not”! These are short minutes of my meetings with Lisbeth from Helsingør Commune from 2012 to 2015. In every single meeting I have asked her to move me from the group “other problems than unemployment” (= fully disabled to work!) where she and the Commune has put me because of their “inability” to understand that I work and function completely normal, and every single time she/the Commune has refused and have been “this close” to transfer me to Permanent Disability Pension, which I have fought against (because I am NOT disabled! ), and the worst is really that I have NEVER been unemployed – I have continued working full time as writer all of the time, which EVERYONE including the Commune can see (but “cannot” approve of) – and still I was forced to going through these humiliating meetings with the Commune. August 17, 2012: Lisbeth encouraged me to apply for permanent disability pension (!!! ), which I of course refused, and instead she gave me my freedom the rest of the year to write before she will do anything. She emotionally “lost it” because of she considers me to show “lack of respect” and insult her, which is really STRONG and KIND words to help her and mankind via her example to improve by understanding the truth of the importance of good work, behaviour and communication, which she simply “cannot” understand. My mother showed herself as Virgin Mary to me around Lisbeth bringing her a love declaration, which I do believe Lisbeth decided to believe in. November 27, 2012: Lisbeth was “tired” of me and really only wanted a very short “control meeting”, which however lasted for 85 minutes, and again I tried my best to make her understand about me telling her about the truth of “light” and “darkness” coming to me spiritually, the degree of my sufferings etc., and as usual it was to help opening crackings in her for light to shine through. March 5, 2013: The Commune decided not to order me to receive treatment/medication, but they recommended me to apply for permanent disability pension, and if I did not, she would consider forcing me to receive this – “we don’t need your approval”, and the reason was not because of my (very poor) physical condition but my “mental status” (where the Commune has decided to be deaf not understanding that I am fully normal and they are “crazy” when they cannot control their WRONG and strong inner voices in relation to me. This is still the greatest paradox ever where everyone (but the Commune) can see that I work and function fine with all people, but Lisbeth believes that my recent email to her was negative and blaming her wrongly – it is just the truth, which is “impossible” for her to understand. July 4, 2013: I told Lisbeth about the death of my father also to make her see me sad as a “normal man”, and I kept on telling her about my experiences, why I speak as directly as I do (to receive darkness of people and to make people understand through their thick armour), about cleaning darkness via faith of people in me, my sufferings coming from darkness of other people etc. and this was again about bringing the light in via cracks of her darkness not believing in me, and she told me that she has “saved” me from meeting a psychiatrist of the Commune, who would have ordered me to take medicine. October 28, 2013: I told Lisbeth about the dark New World Order to make her understand and obtain faith in me, and also that I have NEVER been crazy or incapable to work, which everyone VERY CLEARLY can see, but still “you cannot be the only one who is right, and everyone else is wrong”, so still an “insane woman” who “cannot” tell that I am completely normal. February 14, 2014: Lisbeth and the Commune still consider giving me permanent disability pension to “spare me” from meeting them every three months. I told them that it would be WITHOUT my approval. I am “completely useless” in the eyes of the system of Hell, the man with the best skills in the world. May 12, 2014: I met Lisbeth from the Commune again “on the very top” of the State Authority, and the decision of her and the System of Hell of what to do with me is based upon the influence of all of my family, friends etc., thus the world, to me. Will the Commune decide to give me permanent disability pension because they are convinced that I am crazy even though I have showed them that I am completely normal as everyone immediately can see and (still) fully capable of working and do it better than everyone else (even though I am actually disabled in reality, which I however have rejected to be for almost five years in their system working my best/hardest) or will they accept that I continue receiving “survival help” until I will get my own income? This is what the meeting of today was about, and the system will decide on this within the next month or so. There is a growing fear of the system that they have done a terrible mistake in relation to me. September 4, 2014 (nothing had happened before the meeting – “empty threats”): I met with Lisbeth from the Commune again today, and before the meeting I was told that she will help me to stamp in and she was the one keeping the airplane of our New World back. I had GREAT trouble remembering for days before the meeting what I would tell her and then to tell her at the meeting, but eventually I came through it telling her about creation including the world turned around opposite to the Source (to use energy of darkness to create), “the act” of the Universe sending darkness to man because of darkness of man (the Universal Rule), which brought the dark New World Order of the World Elite that played an act with the plan to eliminate most of mankind, which I gave her examples of, which was really done because of darkness of man self and the Universal Rule with the higher purpose to bring energy for creation, and the “sickness” of man who “knows better” without knowing anything (part of being “turned around” as darkness), which was to tell Lisbeth that I am the only light of the world bringing you the truth to understand and that people generally are COMPLETELY DEAF and BLIND, and the same applied to me when everyone “just knew” that I was crazy not having to read/listen to me. This is also why the system above her used her as the front end to eliminate me doing their best to lock me up at psychiatric hospital, and she was the diamond of the pick-up with all of the system of darkness standing behind her being the gramophone. Again today I did my best to make her understand the truth instead of lies/acting of the world and to cut through her armour to make her understand that she and the system are crazy when they “cannot” understand what is really easy to understand if you just do your best to read/listen. It led to the conclusion that I am now done with everything, we have now brought in the piano of the Source after we had finalised creation in 2012 and I told her about the light of the Source at Hittarp, about the landing of the spaceship of everything and the opening of our New World now coming here in September. And I told her about Karen, how she opened me spiritually and about our very special spiritual connection being male and female life as ONE of the Source and my emails to her making one part of her happy wanting to see me and the other part thinking of me as “completely insane” doing her best to block me out. I asked Lisbeth why she believes that I do my absolutely best to make her understand as the only one whenever I meet her (? ), which made her say that “it doesn’t matter what I believe” (! ), but Lisbeth’s belief is about bringing out life self! Lisbeth is a nice and patient lady, who listens but is (objectively) a fool when she “cannot” understand, and she will soon look herself into the mirror where her new self will tell her “you were completely nuts, Lisbeth – Stig told you the truth, but you were crazy when you “could not” understand“. December 2014: I should have been called in for a new meeting, but I have heard nothing from Lisbeth/the Commune. They tried to remove my cash help in 2011/12 when claiming that I was responsible myself of my own unemployment because of the wording of my job applications (for example to DSB) as part of the plan of my sister to weaken me (for the system “to bring me in”), but they did not have the courage to do it after all when I told them straight out that I ONLY write the easy to understand truth for everyone, and Lisbeth and the system know that they are “very reluctant” to pay out the Special Home Aid as they owe me, see below, and finally you have understood that I was right (and light) and the system was wrong (and darkness), which is why they have decided to “take a break” from seeing me, and yes, Lisbeth was in reality an INFORMER bringing “her version of the truth” to the system and my system working behind her and controlling everything, and there was only one problem, and that was YOUR MISUNDERSTANDINGS working as the System of Hell when you “could not listen to and understand” that I told you the truth, so you may be embarrassed because of all of your misunderstandings, wrong reports and poor work in relation to me making it “difficult” for you to look me into my eyes? My site on the website of the Jobcentre says that I agreed with Lisbeth on September 4, 2014, to meet again in December 2014, but since I have heard nothing. This is written on March 10, 2015, so the truth may be that the Commune knows about who I am and feel “too embarrassed” because of what you did to me to call me in again? April 14, 2015: Helsingør Municipality lied to me still playing the game of darkness! For the first time ever, I recorded my meeting with Lisbeth from the Job Centre of Helsingør Municipality as you can listen to here. The meeting lasted for 45 minutes in total, and it starts after 45 seconds when I meet with Lisbeth in the reception and it continues at 01:37 at her office now with improved sound. I told Lisbeth that I will now end the game explaining her about my spiritual experiences because the game between darkness (of my sister receiving ”darkness disguised as light”) and light (of me receiving ”light disguised as darkness”) is coming to an end. I asked Lisbeth ”key questions” if she has reported about me and our meetings to the system above her without including this in official journals, if she has spoken to my mother/sister/network without informing me, if she has received instructions from the system above on ”the desired outcome” of our meetings including to remove my cash help in 2011/12 and later to give me permanent disability pension, and she swore to God that she has not (! ), but she did confirm that she reported me to the Police as a potential Breivik in 2011! Lisbeth still wants to give me permanent disability pension not seeing that I work with normal capacity and have normal relations with all people as everyone else can clearly see and hear (! ), and this is because of her ”case” of me including a (WRONG) psychiatric declaration saying that I am crazy, and my “long emails” including spiritual information. Sadly, it is Lisbeth self and “everyone else”, who is (or now was with more and more believing in me) “crazy” when they believed that this is what I am, and it was their own inability to read/listen to me with an open and objective mind to understand, uncritical belief in the system against me, poor work/thinking capacity, laziness and a wrong attitude that made this happen. You “believed” that I was crazy without “knowing”, and you can only blame yourself! Lisbeth is brainwashed by the system against me, and still loyal to the system because my sister and brother-in-law, Sanna and Hans, have not told the system to stop the game against me. After our meeting I was told that she is connected to ”the secret IT system” of the elite knowing – and reporting – ”everything” about me. August 13, 2015: I had the shortest meeting ever with Lisbeth from the Commune; I asked her to speak the truth, which she claims that she does. It is NOT me, who is angry/negative, I just write very directly, but objectively, it is the receiver reading it having negative emotions! November 5, 2015: Lisbeth from the Commune plays angry with me and cannot apologize! Listen to the sound file here: https://archive.org/details/MeetingWithLisbeth20151105. This morning at 10:00, I had the new meeting with Lisbeth from Helsingør Municipality (“Commune”), and I had absolutely no motivation to go because of how poorly I felt, because it was raining and because I expected that Lisbeth would meet me with negativity after having received a copy of my email to Helsingør Commune the day before yesterday and yes because people do NOT like to be told the truth about their incredible poor performance, and if she and the other employees at the Commune had just done their job fine and treated me correctly, I could tell them and they would smile at me, but no, this is not how it is, I was again expected to be treated negatively and wrong by people having mistreated me. And this is exactly how it went. First, I was wet and had to dry myself at the men’s room, and after coming to Lisbeth’s office and a little bit of small talking, where she saw how big I have become and don’t understand the true meaning of what it means to be ”without energy”, which is like constantly fainting, Lisbeth, truly being WITHOUT energy, she suddenly decided to let it all out on me because of my email to the Commune saying that her purpose was to remove my cash help and get me locked up at Psychiatric Hospital, and yes, suddenly she lost all control and yelled at me, which surprised me, and when I tried to explain to her what she has done, she decided NOT to listen at all, and all I could tell her was that she had practised well, which was about “playing her role”, and no, she has NOTHING to apologize as she said (! ), and when leaving, she was still so “upset” and found me so gross that she did not want to shake my hand to say goodbye, and I could only tell her that this feeling is WRONG, because it is NOT her, who is offended, it is me being offended and almost killed by this system of Hell, and I do believe, that you are able to “understand” this, Lisbeth, when you decide to understand, right (? ), and yes, you can listen to her show here and decide for yourself what you believe of her behaviour acting as a “professional”, and yes, a LIAR is what she still is because she and the system has decided NOT yet to come clean – before everyone else does as I was told before the meeting – and to apologize, and instead, they give me this performance, and no, it is not right, right? What a terrible behaviour of a spoiled ”lady”, and I wonder if Lisbeth afterwards regretted that she could not control her negative feelings again, thus showing her wrong and unjust attitude towards me. And I kept on feeling her later, has this episode now already been reported to the management and ”system above” by her via the secret system (? ), which is what she claims does not exist and no, there is no ”plot” against me, this is what she has been told to say, right Lisbeth? And guess what Lisbeth fears the most too (? ), yes, just like your mother, to open up all of these secret archives showing the plot against you. This is why it is still an ashtray, i.e. darkness we go through even though everything here is light. And can it be that the Commune and your mother have been in contact lately speaking about when or why these archives have to open? No, Lisbeth is not mad at you at all. Lisbeth wasn’t part of the people planning to abduct you and lock you up at psychiatric hospital, was she (? ), and yes, it could not have been done without the Commune participating. I had a nap from 13 to 15, and was still so tired at 18:30 that I could not keep my eyes opened, and yes, another day in Hell, and probably because of negative influence by the Commune sending me darkness because they don’t like me at all – for speaking directly to them about their poor work. On days like this, I truly “cannot” get up from my sofa just to get something to eat, it is “almost impossible”. I felt Søren, the previous mayor of Lyngby, and was told that they knew about my win over Helsingør Commune via “the secret system” too. Why do you think Lisbeth lost it as much when you mentioned the DSB application (as she used trying to stop my cash help), and yes, because she knows that she will be revealed too. And I was told that it was my confrontation with her reporting of me to the Police and apparently never speaking to them again (!!!) that made her feel poorly knowing that she has been revealed. May 17, 2016: Lisbeth, Helsingør Municipality, apologizes for her BIG MESS, but still plays an act lying to me. I also asked her if she would tell me the truth of how she is working for the elite – going up to the top of the Danish government and the United Nations – against me, but she would not, she still claims that she has told me the truth all along, but if she really had, she would not have reacted as “defensive” as she did today, she would have been much stronger and told me that “you are crazy”, but she did not, and I felt during this that “she has received training from Hans on how to handle this situation”, and I do believe that I could see on her looks and gesture at the very end of the meeting that “I am sorry that I cannot tell you the truth”, and this is how it is when you have a muzzle on, and accepted to be loyal to the system instead of me, which I had wished you would have done here at what looks like “our last meeting”, this is the end of the story as you chose it to be, Lisbeth, to be loyal to the system. And yes, she has “considered” for more than one year to force me on early retirement pension, and when I asked her if she still considers doing this, she said “yes, and I may consider this for another year”, and yes, what a “completely crazy” answer to give (? ), and yes, I asked her for a copy of her report of me to the police, but no, she did not do this in writing, she said, only verbally, so there are no papers with the police showing otherwise and also on exchange of information from the police and Commune about me (? ), and yes, you are truly A BIG MESS, Lisbeth, but as I told you, I like you much as a private person, but I do NOT like your role as a representative of the system of darkness as you do understand, right? At the meeting, Lisbeth also said that she does not read me, but after the meeting, I was told that she actually reads both my scripts and also “secret files of the system” in details explaining about my sexual aviation etc. The official attitude is that you have kept very long not receiving payment day yet, i.e. force of the Source. July 12, 2016: Lisbeth from Helsingør Commune forces a rehabilitation plan on me even though all can see that I work. I was very tired this morning, so tired that I “could not” leave my apartment and did not want to use energy speaking against Lisbeth from Helsingør Commune and her system of Hell, which I felt that I could not because I had no energy, but still, I had prepared myself mentally on what to ask her and what to say. Despite of my tiredness, I first cycled to town at 09:00 – I had to buy a “morning-offer” (morning bread for 60 DKK) before 11:00 – and afterwards, I cycled to the Commune uptown, and started my meeting with Lisbeth at 10:00 as you can hear in its entirety of almost half an hour from the link below, and I was really so tired at the meeting that this alone made it difficult for me to find and bring forward the right words, but I do believe that they understood as the world will too. As you can hear, Lisbeth has decided to let me go through a “rehabilitation plan” – to determine my work capacity – which she claims is to help me, not the system (! ), and as I told her, this is incredible humiliating and offensive to me, a crime against man (! ), because everyone can see that I work from the forthcoming scripts etc. to my website, despite of how I feel physically, which may be approx. 20 hours (or more, in fact) per week, and because I have good relations with all people that I meet – for example also Lisbeth’s colleague today sitting at Lisbeth’s office and overhearing the meeting – and the only ones, who cannot and will not understand is this system of Hell, which has decided as dictators stealing my freedom that I am unfit to work (because of a doctor’s specialist declaration “bought by the system” with the task to declare me schizophrenic to “break me down” as he did in 2012 as you can read here https://www.scribd.com/document/97739504/Specialist-declaration-of-psychiatrist-Alex-K%C3%B8rner-on-Stig-Dragholm, and you can read my memo to him at the same day explaining him and everyone about the truth of my spiritual experiences, which are REAL and NOT “hallucinations”, as he and the system know (!!! ), see here https://www.scribd.com/doc/97171477/Memo-for-psychiatrist-Alex-K%C3%B8rner-Psychiatric-Centre-North-Zealand), and I could only ask her to withdraw this plan as result, which she refused to do, and this made me conclude that when you do this play, Lisbeth, you only exhibit yourself and the system of Hell to the entire world, which made her say “so let it be”. I also asked her if the script had already been written in forehand deciding that the outcome of this “plan” will be to declare me permanently unfit for work – even though everyone can see that I work (!) – which will also fit with her 1½-2 year old plan when she wanted to give me early retirement pension (because of disability), which I refused, because I do NOT want the system to officially declare me unfit to work because of “craziness” – as all can see that I am not (!) – which is still the goal of this darkness working against me even though they now know that it is wrong, but they still follow the plan because they also know that it is right to do wrong in an opposite world to bring me darkness to clean, this is how it is only a play today, and she declared that this is not the case (! ), but still she said “I hope for you that you will get it” (!!! ), and yes, how can it be that this plan is to help me and not the system, when I do NOT want retirement pension, and she does (? ), and no, it does not make any sense at all as I do believe everyone easily will be able to hear if you just decide to listen to our meeting and my “fight against this darkness”. And still, the meeting was held in a good mood and it ended with my encouragement for Lisbeth and the Commune to offer me coffee at the next meeting – I have never been offered coffee at the Commune, even though this is what you are ALWAYS offered here at “normal meetings” – and yes, coffee is an old symbol of “warm feelings”, and this was just to say that Lisbeth has warm feelings for me as I have for her, as good friends, which is what I was almost telling her that we are becoming when she said that we will soon meet again, and I also told her that I will bring cake then, which is an old symbol of “creation”, which was just to tell them that we are really ready and done. When I was leaving, Lisbeth said that normally it rains and I become wet when meeting her, but it was good weather today, and yes, this is true, but it only took a few minutes on my cycle before a big rain shower came by making me wet! Before, during and after the meeting, I continued feeling and being told that this is Sanna’s game, i.e. it was her decision to let me go through this rehabilitation plan, and not yours, Lisbeth? Later in the day, I felt Lisbeth several times, and was told that she has read all about you including your school – as we talked about today as the beginning of the rehabilitation plan, even though my school period from 1972-84 has absolutely NOTHING to do with my work capacity today (!) – in the secret files of you. Lisbeth is constantly reading about me. And she knows that she was killing me for the system. August 25, 2016: Helsingør Commune play a PARODY when they reject giving up on their rehabilitation plan on me – even a kindergarten child can see that I am completely normal! This morning when planning to go to the meeting with Lisbeth from the Commune, it was with the old ”I really don’t want to go” feeling, which is how it is when being met with lack of understanding and resistance, and to decide using energy speaking against this system, which requires much of me when being ”completely empty”, I do not like it at all. I had decided in my head to give a summary of my experiences from when I was spiritually opened in 2004/06 (as I have told Lisbeth about before, but to remind her, how I continued working as normal (”nothing has changed” to Stig to people not knowing) until 2008, where I showed Sanna my writings and how she – ”on behalf of the family” – took me to a phyciatrist, as I accepted to do to give them ”peace of mind” – and how she actually got me hospitalised to phyciatric hospital, my trip to Kenya in 2009 to find people believing in me (LTO, I should have told Lisbeth that I did not only write my scripts while being with them, but also that we made the Dadaab memo together, so we actually did work together, which is why I was expelled from Kenya! ), which was impossible here, my continuous writings where everyone believed that ”Stig is really crazy” until Sanna and Hans started understanding and from 2013 started supporting me to bring world support (of the elite) in me, and I did this, which only made Lisbeth decide to continue lying to me with words like ”I am not in doubt that you have had these experiences, and believe in this yourself” etc., and yes, by now, I can only take this as an insult, Lisbeth, because ”everyone”, including you, know about who I am, which she denied that she does (! ), and because I am actively working to STOP YOUR GAME and to bring me my deserved TRUE ”REHABILITATION”, which is NOT to go through your CRAZY PLAN, but simply for you to give it up because even a child in kindergarten can see that ”Stig is completely normal”, as everyone instantly can (when I do not talk about my spiritual experiences), and I am now so tired of this game and so close to stopping it (when I will stop working) that this is what I want the system to do, which is to STOP THE ACTING and simply say ”we know, Stig, we will give it up”, and when you do not, which Lisbeth ”could not” (also because her manager in a letter to me the other day said that they ”could not”), it is no longer just an act, it is truly A PARODY (!!!) because here ”the experts” still cannot (will not) do what everyone else, who does not need special intelligence, can do when seeing and feeling me as a ”normal man”, and this is how this System of Hell will be portrayed to the world through my writings. After the meeting, I was shown myself inside the clock of the Town Hall Tower in Copenhagen on my way out to the light on the other side of the clock, and I was told (as many times before), ”Lisbeth knows”. And I was shown myself in a coffin being carried out from a beautiful French Cathedral, and I was told that this is what they help me to do, and know about. No, there is still nothing that Lisbeth and darkness hates more than being shown to the world as incapable and now as crazy, when the roles have turned around, and I feel Sanna strongly here, are you sure you don’t talk together directly? October 27, 2016: Message to Helsingør Commune and all: If it was not for my sister, I would NEVER have been declared “crazy” (“schizophrenic”)! I had been encouraged for days to continue playing the game when meeting Lisbeth, so I had prepared to give her an “update since last” including the rejections from the Patient Board and “crazy Alex”, the psychiatrist, to withdraw his wrong “death-sentence” of me from 2012 (as “schizophrenic”/crazy), which I had decided to ask them to do because I do NOT like the “rehabilitation plan” that Lisbeth forces upon me because there is NOTHING to rehabilitate me from, which is such a humiliation of me, and my message to her, and everyone else, is that if it was not for my so called “caring sister” in 2008, who took me to meetings with our doctor and a psychiatrist in Hørsholm in 2008 (after I had presented my first book to her), I would NEVER have come in contact with the psychiatric system and NEVER received the sentence “crazy”, and I underlined this with the medical examination I went through in 2009 in order to be “hired” by the Lutheran World Federation in Geneva (to become a volunteer at the Dadaab refugee camp in Kenya!) as you can read about here https://stigdragholm.wordpress.com/normal-life/the-un-ngos-and-media-execute-the-poor/#Cold, which was “perfect” and also included an evaluation of my mental capacity as “normal” and “fit to work”, and the difference here is that they did not have my “worried sister” to influence them and also not access to my journal (“history”), which is what Alex Kørner had in 2012 and “the whole system” and then they do not have to think twice about this because then I am officially branded – or “stamped” as Lisbeth said with inspiration – which is how it works, and yes, it is almost impossible to have such a WRONG sentence lifted, and it took “no time” to get it with a superficial system knowing from their textbooks that “voices in the head” is the same as “schizophrenia”, but it is not, this is WRONG, and everyone would be able to tell if only they decided to read me carefully to understand, which is the difference, and if they cannot read, which goes for all of the system afterwards, they will all believe in this first judgement from 2008 that Stig is really crazy, thus not to be trusted, which is what drove the works for Sanna, this is what she wanted to “get rid of me” and receive the attention and faith of the world, and this is what she did for a long time without knowing about the effect of my writings, which succeeded to bring over the world elite to my advantage, but as you can tell, there are still many on the levels below, who believe that I am sick without understanding that they are to blame themselves for doing a poor work because of laziness, better-knowing ignorance or/and lack of time, and yes, you cannot decide on what is right and wrong without doing your work properly, as they did and continue to do with me, which is what the story of Benedikte the other day is example of, but this is how most people of today work, being superficial not doing your work good enough, and still most people believe that they do – including Lisbeth. And Lisbeth again showed herself as example of a person have strong better-knowing ignorance, and yes, I gave her the paper below including examples of artists etc. receiving spiritual information as foundation of their work, who are seen as normal by all because they have not been in contact with the psychiatric system – if they had and they told them the truth of their experiences, they would all be branded “schizophrenic” (!) – and instead of understanding, Lisbeth continues to “not understanding”, this is how she (and many others) receives new information, it goes through her “negative filter”, so instead of accepting the message that these people are normal, as I (! ), she concluded to herself that Leonard Cohen probably does not receive spiritual information because she has just read a biography on him saying that he has taken lots of drugs, which then must be the reason why, and yes, she does not have to go deeper in the lyrics than the examples I gave here also on Prince, David Bowie, Depeche Mode and Lars Hug because if she did, it would be easy for her to understand that they receive spiritual information as foundation of their work, and we know, she bases her opinion on far too less information, this is the sickness of the Devil. Can you want it any more clearly that this? Lisbeth’s filter/mind makes “excuses for herself” when handling my information because when I told her about how the doctors and the whole management of LWF in Geneva in 2009 saw me as normal, she concluded to herself that “a development may have happened since” (! ), and yes, this is what she really said (!!! ), and this is how it is all of the time with these people, they do all they can NOT to understand instead of simply understand, they cannot be trusted simply because they cannot understand. And if this makes me sad (? ), yes, this is the ruin of the Devil, destroying people’s ability to understand/communicate as the mean to end the world! So the conclusion is that either Lisbeth is one giant fool (because of her inability to understand) or actor (because of what she knows), or both, which makes me very sad, this is how all people are (“more or less”), and they cannot and will not understand that they are. She finished her rehabilitation-case against me to give me permanent disability pension because “Stig is crazy” even though all can see immediately that I am completely normal! This morning, I had my new meeting with Lisbeth at 10:00, and if there was something I did NOT want to do, it was to cycle the five kilometres there and to face “the Devil” once again – to use much energy on this, while I really still have much work to do – and on my way there, I was told about how she/they speak about me behind my back. I got there, and I was met by Lisbeth with the most repulsive welcome as I have ever received by a person (! ), which was not even a hello, not even a handshake and a smile, no small talk on the way to her office, she instantly turned her back to me, which is only how the absolutely worst darkness acts, and no, my writings on her does NOT allow her to feel “hit” and to act this negatively to me, and this was only the beginning, because when the meeting started, I was given a loud of dirt as she obviously wanted to get off her shoulders when she burst out with a loud voice telling me to stop writing emails about how dumb she is, and yes, this is what she still cannot take and obviously still fight against believing that it is unreasonable and wrong, and I tried to tell her that it is WRONG of her to focus on these personal details, the right thing to do is to focus on the true content and to understand it by reading it, and yes, she said that she has read all of my long emails, but no, she is “too busy” to see the attached videos of Ships and Spaceships of the Source, which is why I told her that she can only understand by doing this and also to read my chapters on X Factor carefully, and many of them, to understand the content, but it was as if this was flying totally over her head being on a higher level than she can take in, because all that filled her head was my “negative tone” on her, and she was supported strongly by her “colleague” in her office, which I was now told is really her manager (! ), and yes, “nice for you” to have support against me, if needed, right Lisbeth (? ), and it came to the point where I had to tell them: It is me being the victim and you the executioners, it is not vice versa, but this is how it is in an opposite world, and now stronger than ever because my emails to them and the system were stronger than ever, so this is how “the worst darkness” came to me, which is logic to dig out the last part of me, and yes, it is still “opposite” on the other side, this is the logic as people, who follow me, will understand. Hereafter, she continued on the questionnaire from the rehabilitation scheme as she started on months ago (! ), and I could only ask her “do you enjoy humiliating me by doing this” (? ), “you would hate me to do this to you if you sat in my chair” and to encourage her to “put away those papers”, but no, she would not, and when I asked her who had ordered her first to remove my cash help (2011), then without any need to visit the “sick psychiatrist” in 2012 and now to do this rehabilitation case with the direct purpose to declare me “crazy”, she said that it was only her, and yes, this is what she really said, so no one has asked you to commit crimes and abuse of power in your “creative way” of handling my case, Lisbeth (? ), and yes, you know that I know, but still this is what you tell me, and yes, she is clearly part of the act against me, but can it be that she is just receiving orders from above truly believing that I am crazy, and not part of the group with my sister, mayor and others working against me (? ), and yes, the difference between being a true actor and dumb as a door, and when I asked her if she is actor or plain dumb, she told me that she is not acting – so you are simply PLAIN DUMB because you “cannot” read and understand me with an open mind when the authorities above you including quacks have laid out this WRONG trail for you to follow, which is “too strong” for you to break, you “cannot” because of your business, laziness and better-knowing ignorance. You can listen to the meeting yourselves via my new recording, and yes, I was surprised that they did not ask me if I was also recording this meeting, and apparently you have not discovered that I have recorded the meetings from the last couple of years even though I have shown you in my scripts and links (? ), which you have not seen because you have not read me carefully, is that it (? ), and yes, if they had asked me about my recordings, I would have told them that it is WRONG in my mind not to tell them about this, but this is the only way that I can show you how this abuse of power of STONE DEAF people work, and if they had asked me to stop doing this (to hide their crimes), I would have refused, this is my freedom right to do – especially as “the weak part” being the victim, not the opposite, right Ombudsman of the Parliament (? ), who “cannot” decide on what is right in this matter. So this is how they are now about to give me their final dead sentence – “Stig is permanently sick because he is crazy” – even though I told them once again that they do this even though everyone immediately can see that I am completely normal having normal working capacity and normal social skills, and that even a kindergarten child can “feel” this right away, but this is how this “expert system” cannot do what is right to do, but is on its way to end the Old World – finally, see? And yes, these people truly hate me because of my “negative writings” on Lisbeth, and they have NO DOUBTS about just how wrong I treat them without being able to see that it is really opposite, where they are dictating, humiliating and degrading me in such a way that you SHALL NOT treat people (! ), which is as unpleasant as it gets – and also their misunderstood feelings because of their own misunderstandings (!) – and yes, with this you can almost imagine how many thousands of people are treated wrongly by this system of dictators believing they do right, but do wrong, which also goes with the pharmaceutical industry and all of the health services etc. Yes, I don’t have to say just how rotten this lousy treatment makes me feel, do I? It is as wrong, negative and aggressive as Samia treated me without being able to understand because of will blindness and deafness. This is how they carry out their judicial murder on me, and if looks could kill alone, this is how their eyes lightened against me, and at one time, it changed to almost tears in Lisbeth’s eyes because you are totally convinced that I am crazy, which is “sad” for me (? ), and no, the truth is that it is me being incredible sad about how it is impossible to come through to you to make you understand about your own wrong-doings even though I have told you the diagnosis straight out (!) and the truth of me, and yes, how do you think they will react when they discover that this is how they treated their own God, who gave them their lives and saved them from their own secure end – because of laziness, poor work and better-knowing ignorance? This is how they showed me infuriating wrong behaviour, and wrongly believed this is what they received from me, no, it is NOT nice being humiliated by dictators taking control over you, this is the worst behaviour I have met in my life, the same level of darkness as with Samia, this is the logic, “the worst darkness”. And no, it was not a nice goodbye from Lisbeth, and I could only tell her to smile and not to be unhappy, but “difficult” it is for her, and “why have you not broken down, Lisbeth”, as I asked her, and yes, did you understand why (? ), because of the spirit of my mother working with you. At home, my teeth were made to scratch strongly against each other, which hurt and made me fear that something had happened, but nothing did, and I was told that “nothing will happen” after this meeting with the System of Hell at its worst. I was thinking about appealing the WRONG verdict of the Commune, when it comes – “permanent disable (“crazy”)” to the Appeal Board and/or to go to court, and it made me feel unpleasant that all of the system works as the Commune works, they “cannot” read and understand, but will automatically believe in the act of my sister making me look mental sick even though everyone can see that I am not (! ), and it gave me a feeling of being declared incapable of managing my own affairs, “the system knows better”, but it does NOT! I was first shown the Eiffel Tower from beneath, and then I was shown myself flying over Paris, everything still ends there. I was surprised seeing a Ship of the Source coming from left with a red light on it (!!! ), which has never happened before, and this was just to show you something unusual – and the negative reluctance of Lisbeth to understand these Ships of the Source. This is at the same time a total sign of failure or collapse of the system that cannot understand, which brings the end of the world. I was given several examples of old stories of me being included in the secret files of me as Lisbeth has access to, including wrong and misunderstood stories of me, which made it “impossible” for Lisbeth to follow me. June 8, 2017: Lisbeth from Helsingør Commune will proceed with the rehabilitation case against me even if the Patient Security Board cleanses me, which is ”completely mad”! I had a new meeting with Lisbeth from the Commune this morning, which I had not looked forward to at all, I do NOT like when people cannot or will not understand me, but work against me no matter what, and this is how it still is, but first she asked me to sign a power of attorney for the Commune to collect the journal of the disgusting psychiatrist Klaus Damgaard Jakobsen, which came as a big surprise to me because he had asked me to give him a verbal authority at our meeting to send it to the commune, as I did, but then he did not do as promised, which only confirms my impression of him, a lazy and irresponsible man. Lisbeth told me that she will go ahead with her case to the rehabilitation comittee in August, and when I told her that the right and natural thing would be to await the decision of the Patient Security Board, where everyone can read and understand that I am right and the system is fraudulent, she said that they would still go ahead with the case because there are other declarations on me, and yes, which I have appealed too, but was not handled because of a crazy time limit, and yes, this only shows how completely mad this system is, and that it is directed by an order from above to ”do this no matter what”, which includes to ”stop thinking”, right Lisbeth? Lisbeth from the Commune had ordered me to a new meeting this morning at 09:00, and on my way there on bicycle, I received a strong pop in my right ear, which I do when people do not or cannot listen to me – as I often do with my mother and the Commune – and this meeting was about the preparation as Lisbeth and the system have used more than one year on to fill out papers, send me to new ”health checks” etc. in order to make the system declare me ”permanent disabled because of craziness”, which of course is all based on ONE BIG LIE AND DECEPTION of the system, which has NOTHING to do with the reality of me being completely normal/sane and having worked full time with my work for years, until recently, and yes, I wrote my comments in my email to the commune last week – see here in Danish https://www.facebook.com/stig.dragholm/posts/10211075788553861, and here for an English summary https://www.facebook.com/stig.dragholm/posts/10211079639890142 – so there was no reason to say all that I have written, and Lisbeth asked me to sign the papers to the rehabilitation committee, and I told her that this case is about so much else and ”now you know the consequences if you go on with it” – I will sue the commune including to report them for abuse of power and violation of my human rights etc. – but it is obviously not Lisbeth, who decides on these matters, so she is only doing what the system above her asks her to do. So the meeting was very short, it only lasted for few minutes, and when I told her that this is our 3rd meeting in 13 months instead of the 4th in 12, which means that Lisbeth again hos NOT kept the obligation of the social law to have four meetings with me per year, and that if it was me doing it, my cash help would have been removed or reduced (! ), she reacted with aggression saying that it is because we have nothing to speak of, and I wish I could do the same in relation to your CRAZY RULES, but I cannot, and this is how Lisbeth again showed WRONG BEHAVIOUR instead of taking up the subject herself saying ”I know I have done wrong, I am sorry”, but this is how the game works, and I am TIRED OF IT (! ), and I had really planned to also tell her, but I did not, that I have a professional background as bank-/pension-/insurance adviser, where I learned how to ask the customer in detail about his specific situation and to do my best to cover his need with my financial products, which I did my best to do, I could never dream about doing anything else, and yes, you do believe that when you then meet the system yourself, for example lawyers, doctors and the administration of a big colossus like Helsingør Commune, it is built on the same values doing it’s best to listen, understand and tailor-fit their products/advise to you, but this is NOT what I found at all, on contrary I am disappointed with all including Lisbeth, who decided to SELL YOUR SOULS TO THE DEVIL via the System of Hell automatically believing in it over me, which is what we call to be BRAINWASHED here, and then do everything you can to NOT listen to me, not ask questions because of interest but because of negativity and to fight me with all you have instead of understanding, helping and following me, and yes, can you imagine being so stupid that it took Lisbeth from 2011 to approx. 2015/16 to find out that the system including herself was wrong, and that Stig is actually speaking the truth, as I have all along (? ), and yes, now you ”cannot” tell me about this because you are obliged to follow orders of the system to ACT DARKNESS to bring the last life and ”golden dust” inside of this to me, which means that you are LYING me straight up my face and acting with ”aggression” of an autocratic system, i.e. to continue acting like a dictator, and yes, this is what makes me sad, this is what is WRONG, Lisbeth, and you all know it, and this is this game that we continue playing until I am completely done with my work and you receive an order from above from the system to rest the case against me, and so it is. After the meeting, Lisbeth sent me a letter ordering me to meet with the rehabilitation committee on January 18 (! ), and if I do not come, my cash help will be reduced, and yes, crazy rules only applying for me, not for Lisbeth! I was told that the commune are more surprised that I am still alive, and maybe you cannot see my sufferings when meeting me, but I am telling you that just to try to match ”impossible sleeping” into a schedule, where I am forced to meet you five kilometres away Monday morning at 09:00, and to cycle there, is VERY difficult, when you are completely out of energy. This was the short story of the Commune, which was very close to killing me with all of its resistance and disgust because I told them the truth of just how rotten this system of the state of Denmark is (! ), which is truly not well liked and this is the same story as when the system of Denmark killed the world-famous in Denmark MP Mogens Glistrup (! ), when he “provoked” the entire system by showing that he did not pay taxes (!) and “such behaviour” is considered both indecent and unacceptable by a “rotten system”, so they decided to sew him and imprison him instead of listening to and learning from him – but you don’t kill me as easily as that, because I have decided to change the world and I am using your rotten system, work moral and behaviour to show the necessity to do so! This is the story of how brainless people of municipalities and the Psychiatric system of Denmark could not administer their responsibilities as dictators over me thus becoming my executioners, when they “could not” read/listen to and understand me with an open/objective mind, but decided to have blind faith in – without questioning – the system having decided that I was not only crazy but a “potential terrorist”, who needed to be locked up and “disappear”, i.e. to have my identity deleted. They did not know that I was the opposite of what they believed, and that they themselves were in fact working for the system of Hell threatening to kill me and all of us. This document includes the journal of the Jobcentre of Helsingør Commune on me from 2011 to 2013 including their registrations on me after our meetings every three months, my email of July 3, 2013, to the director, mayor, and case worker of the Commune, where I ask them to receive FULL insight of ALL of their registrations/information on me including their WRONG actions carried out behind my back by the negative and better-knowing but ignorant director, who feared that I was a potential mass murderer like Breivik, whom he wanted to “get rid of” (to send me behind closed bars outside the Commune! ), and my email to the same people of July 8 telling my case worker that I am NOT impressed with her better-knowing and ignorant journal on me based on rotten systems of the Commune and Psychiatric System all of them being WRONG about me (because of wrong text books of psychiatrics, busyness, deafness and better-knowing ignorance) instead of listening and understanding me with an open and objective mind and for them to think THINK independently to find out that I am and have never been “crazy” and am only telling them the truth about who I am, and when they put two and two together of all information I have given them, they can only conclude that I speak the truth and the whole system was WRONG about me! This is my email in Danish to the official system (municipalities, psychiatric hospitals etc. ): You were the System of Hell MISUNDERSTANDING and TERRORISING me when you believed that I was crazy, dangerous and wanted to kidnap/lock me up on Psychiatric Hospital. 1. Facts about my years as receiver of Cash Help from 2009-14 at three municipalities that all immediately saw me as ”fully capable” and normal – of course. 2. I published my website in 2010 whereafter the attitude of everyone to me changed from ”very positive” to ”very negative” even though I am/was the same man. 3. I am ”the most skilled” because of my attitude and work moral, which is better than everyone’s else – not because I am born better than others. 4. NO ONE believed in my CV even though everyone saw me working as ”the most skilled”, and instead I was considered as self-centred/self-important with hallucinations/megalomania! 5. Lyngby-Taarbæk Commune issued my death sentence when they ordered me to give up my FREEDOM OF SPEECH, and when I refused, they removed my Cash Help making me starve for weeks. 6. Lyngby-Taarbæk Commune hated my writings, and surveilled me because of my alleged ”anti-social behaviour”. 7. A CRAZY and IGNORANT CONTROL-SYSTEM was ”lousy amateurs” that could not understand my CV and my true professional and human qualifications. 8. I told you the truth and the solution for you to improve, but I was considered as ”incredible negative and ill-mannered, placed as disabled and sent for work test assessment! 9. Helsingør Commune considered me as fit for work and normal until a job search course discovered my website and reported me as ”potentially dangerous” and anti-social! 10. Helsingør Commune now suddenly saw me as ”incredible negative”, reported me to the police as a ”potential Breivik” and threatened to remove my Cash Help! 11. The System forced me to see a doctor/psychiatrist, who declared me for schizophrenic even though ”Stig behaves completely normal” and even though I logically explained about my ”spiritual experiences”. 12. Sins/darkness of man brought a dark New World Order that also wanted to make me crazy, hospitalise/kidnap me and carry out reproduction tests with me. 13. The World Elite issued the order to hospitalise/kidnap me via the Danish government to Helsingør Commune, but the director was a wimp, who did not have the courage to bring it out. 14. It was almost impossible for me to convince everyone that I am ”normal” after the system/authorities had stamped me as crazy – my DOOM had been written! 15. I was NOT unemployed, but worked FULL HOURS as writer, which NO ONE wanted to support, but your System of Hell made me unemployed and did everything to break me down. 16. My real purpose was to receive the energy of your System of Hell and transform it – via faith in me – to light and the creation of our New World instead of destruction. This is a summary in English of the full correspondence in Danish as can be seen on Scribd at the end of this document. To have this money paid out from “the system of Hell” doing EVERYTHING it can including illegal actions to avoid it, is a symbol of receiving access to and open the Source including our New World (“money” is a symbol of energy of the Source, which is the basics of all life/creation). “HELSINGØR MUNICIPALITY CHEATED ME FOR 200$ PER MONTH FOR 3 YEARS, SO I HAD TO LIVE FOR LESS THAN 200$ NET PER MONTH. In December 2014 I asked Helsingør Municipality to correct the special home aid, which I have received since 2011 because the Municipality has cheated me when not saying that my expenses for heating, electricity and instalments on home deposit loans are included in the calculation of this special home aid, which means that I have received approx. 200$ less every month for the three years, I have received the aid, than what I am entitled to according to section 34 in the act of active social policy. My estimated calculation shows that the Municipality owes me approx. 7,600$ in total, which I therefore ask them to pay out. To my surprise, however, the Municipality replied that the deadline for complaints has expired, and they forwarded my request to the Appeal Board. But their decision was directly wrong. It had NOT expired! In January 2015 they acted DIRECTLY ILLEGAL, UNETHICAL AND UNREASONABLE when they decided to reduce my benefit (! ), because ”your moving to Helsingør happened on own initiative”, which was not only WRONG, but truly ”RAVING MAD”! In February 2015 I received a new verdict 2/3 in favour of me for future payments, but the Commune still “could not” decide on paying the extra payment for the last 3 years, so they have sent my case to the Appeal Board!!! I sent a new appeal asking to receive 100% now because I am right. March 2015: The Commune also decided not to cover my private home deposit loan without having any legal basis. I have gone back to the origin of the law finding everything there is to know, and I am RIGHT, which is a symbol of going back to the origin of everything of the Source. March 2015: First, the Appeal Board also rejected my case because it had expired! In a new email, I asked them to change their decision, and I also enclosed my writ against the Appeal Board! This money is a symbol of ”energy” of the Source, and when I will finally have it paid out, it will become the start of our New World, which is what this darkness did everything it could to prevent me from doing :-). May-July 2015: The Appeal Board now decided that they will deal with the case. The Court decided that they cannot process the case before the Appeal Board will take their final decision around September 2015. October 2015: Finally, the Appeal Board decided in my favour. I won the case, and now only await for Helsingør Commune to calculate and pay out the amount they owe me from 2011-15 – which they did in November 2015 when they paid out DKK 40.860,95. Later, they paid out an extra DKK 1,027,87. December 2015: I decided to continue my case in court to receive interest of too late payments and cover of my own “legal expenses”. March 2016: Helsingør Commune decided to pay me DKK 6,000 in interest. I also asked Helsingør Commune and Helsingør Court to reimburse me for “hundreds of hours of work”, which was only forced upon me by the illegal actions of the Commune, both the court and the commune decided to reject my claim – even though this was carefully documented, and even though I do believe that all will understand that this would have been right to do. I decided to settle the case on this foundation in March 2016 – with a last email directly to the mayor and director of Helsingør Commune asking them to use “the golden rule” and reimburse my work with DKK 10,000, but I never heard from them! PS: The Appeal Board decided in March 2016 that the commune has to pay out an additional DKK 1,800, which made the total pay-out approx. DKK 50,000. Mails from May to August 2015 to Helsingør Commune and the Psychiatric Centre: To ”the system of Hell”: CANCEL your WRONG verdict/diagnosis of me! In this email, I ask Psychiatric Centre North Zealand and Helsingør Municipality to CANCEL the verdict/diagnosis, ”paranoid schizophrenia”, which ”the system of Hell” WRONGLY gave me in 2012, which was planned before my birth (!) to make the world believe that I was crazy and enable the world to empty my mother and I for ”the secret of life” so it could create its own new world, which however would have led directly to the end of the world. Psychiatric Centre North Zealand and Helsingør Municipality were my executioners because this wrong ”verdict” was really ”the planned murder on me” (man killing God!). The system and my family, friends, former colleagues etc. all believed that I truly was crazy, but now ”everyone” finally knows that I just spoke the truth of my self, and that my mission was not to bring the end of the world, as the world misunderstood (! ), but on contrary the survival of the world and my New World of endless life and joy without sufferings. I received NO reply to my email of May 27 to the Psychiatric Centre North Zealand and Helsingør Commune at all (!!! ), so I sent this new email asking them again to change their WRONG verdict/death sentence (”crazy”) over me. It screams to Heaven that they do not reply, because this is what a public authority ”automatically” does, and here two authorities have decided to ”shut up” together, thus really showing their guilt and poor conscience to the world because this is ”far from normal”, i.e. ”completely crazy” to do. They and the world now know that it is NOT me, but the world self, that was crazy (born in darkness), and had they succeeded locking me up behind bars on Psychiatric hospital and ”experimenting” on me, it would have brought the end of the world, and not their new world as they hoped for. Only because I was stronger than your system of hell, I managed to save you to bring you all my New World. I will not report these two authorities to any appeal board, government, UN, court system etc. or demand punishment on them because of their abuse of power, poor principle of administration, illegal handling of my personal information, manipulation of the world, lies and deceit, and plans to further torture, (sexually) experiment/operate on me and finally to murder me. But I ask them to speak out the full truth, ask for absolution and publizice all IT-systems and archives/registers on me – and on everything, really. Their system of hell had no problems turning me into the opposite of what I am claiming that I am crazy, disabled, insensitive and have poor social relations, when the truth is that the world is crazy, I am not (! ), have worked harder than most for everyone to see (! ), I feel the deepest and have good relations with all people I meet, which should be easy for everyone to see, but not these ”experts”. These were the people working in first line meeting me on behalf of all of the system of hell, these were the people bringing me the greatest sufferings in the world, but it was planned by my inner self to receive darkness to clean and transfer to our New World as new life, therefore :-). ”Everyone” knew that ”Stig is raving mad” even though all can see that I am completely normal and write the truth based on my spiritual voice (”the Source of life”/God). Psychiatrics guess wrong based on wrong foundation – cancel your WRONG dead-sentence of me, grant compensation or give me at least an unreserved apology. ”The system of Hell” could not defeat me with your ”hidden agenda”, you are ”too stupid” and incompetent to evaluate me correctly, therefore: WITHDRAW! August 22, 2015: Psychiatric Hospital North Zealand run away from their responsibility because of the WORST BUREAUCRAZY!!! Finally, I received this letter from the director of the Psychiatric Hospital, Martin Lund, to my latest email to the system of August 12, which was nice of him (! ), and where he regrets that I have received no answer to my previous emails from the Psychiatric Hospital North Zealand, and to my surprise “he runs away from his responsibility” by saying that the declaration on me is obtained by Helsingør Commune, which is the reason why they “cannot” handle my “complaint” – because it is not issued in connection with treatment by the Psychiatric Hospital (! ), but he refers me to Patientombuddet (“Patient Duty”) where I can send my complaint (! ), and yes, in this case it suddenly becomes possible for you to handle my complaint (! ), and yes, what b…s… as I am told here because you and I know what is the real reason behind this wrong declaration of your hospital, but you decided to break the silence by giving me a lie, which your system “could not” do without you? I understood the Pastors of Lyngby Church, but they could not UNDERSTAND me – not even the Church was “able” to recognise/support me because of their strong voice and selfishness! After moving to Lyngby in November 2009, I started visiting sermons of the church of Lyngby every Sunday where I received very good relations with the four Pastors on turn, which is the general story of how people saw me until they discovered just how “crazy” I was when publishing my scripts in February 2010, where I also sent the Pastors links to my website and examples of what I had written about their services for them to see that I had written what they said 100% accurately (! ), but I was met with amazement and silence by the Pastors, who could not “read and understand” me despite several encouragements and despite of all of them having noticed just how carefully I was listening to and understood their sermons (! ), which by the way was despite of a constant negative voice speaking to me spiritually at the same time as I had to focus on the sermons making this “almost impossible” of course, which has really been the case generally since 2006 and yes “more and less” and around the clock. The pastors could not overcome their own strong voices telling me that it was IMPOSSIBLE for me to be Jesus (!) – which I really was not, because I was God and the Holy Spirit but that is another story J – and instead of Pastors understanding me, I was told by one of them that spiritual experiences as I “claimed” to have (!) was not possible at all to have according to the church (!!!) – do you see just how crazy the church was too (?) – and the irony was that one Pastor in one of her services asked the assembly how they would react if meeting Jesus in the supermarket and she wondered what teachings Jesus would give this time around, and she was herself to give the answer when she met me, and her reaction was with astonishment and fear (! ), silence and thoughts that “he must be crazy” and this “never, never” happens to me (! ), and this is how she did not have to read my “teachings” in order to determine that I was a “lunatic”. I continued doing my best hoping that the four pastors eventually would start to listen/READ and understand – how difficult could it be just to read (?) – when the nice Pastor Leif eventually decided to invite me to his home for a private meeting, which of course was nice of him, but when I started telling him the truth about who I am and my experiences, I understood that he was nodding but his mind was not following me, I had lost him and with him also his colleagues and herewith the entire Danish church, which could have supported me, which would have brought another scenario of a story, but here it was also anticipated because this lack of faith also helped me to reach “nothing” to reconnect with the Source and suffering too because do I have to tell you how sad it made me that the Pastors did not have the “time” – or interest – to read and understand me, I did my absolutely best to try to make them understand, but they judged me as an impostor without doing what it takes to understand and that is even though they should have concluded that “Stig is really unusual and not stupid” (! ), and instead Pastor Leif as example continued showing a passionate interest in the writers Grundtvig and not least Kirkegaard because Leif LOVES to read intellectual writings, but of course it was impossible for him to read and understand such a man like me and do I have to tell you more about the darkness of the world opposing me? Even the church was not able to recognise me because of your selfishness and own strong and wrong voice! In this email to the United Nations of the world via the present Danish democracy, I describe the “system of hell”, which I have gone through from the bottom being exposed to the worst torture of the public labour market and psychiatric systems and a careless power elite all the way up to the Danish government and the United Nations of the world showing their plans to introduce a totalitarian New World Order. I ask this “system of hell” of the world to surrender and file its collective resignation to me, and I inform about our true New World Order and World Government as foundation of life self based on the golden middle way bringing FREEDOM and RESPONSIBILITY to all. Read this, the next page of my sufferings here. This website was first published November 12, 2011, and has since been updated some times.